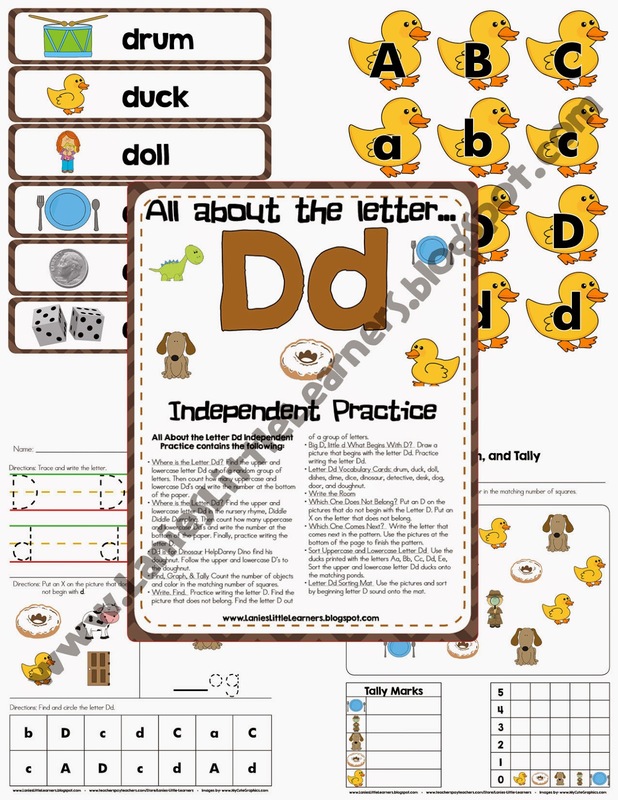 The All About the Letter Dd Independent Practice Packet is the perfect accompaniment to the All About the Letter Dd SMARTBoard Activity. I have used a variety of the activities in both whole and small group instruction. Where is the Letter Dd? Find the upper and lowercase letter Dd out of a random group of letters. Then count how many uppercase and lowercase Dd’s and write the number at the bottom of the paper. Where is the Letter Dd? Find the upper and lowercase letter Dd in the nursery rhyme, Diddle Diddle Dumpling. Then count how many uppercase and lowercase Dd’s and write the number at the bottom of the paper. Finally, practice writing the letter D.
Dd is for Dinosaur Help Danny Dino find his doughnut. Follow the upper and lowercase D’s to the doughnut. Write. Find. Practice writing the letter D. Find the picture that does not belong. Find the letter D out of a group of letters. Big D, little d What Begins With D? Draw a picture that begins with the letter Dd. Practice writing the letter Dd. Letter Dd Vocabulary Cards: drum, duck, doll, dishes, dime, dice, dinosaur, detective, desk, dog, door, and donut. Which One Does Not Belong? Put an D on the pictures that do not begin with the Letter D. Put an X on the letter that does not belong. Sort Uppercase and Lowercase Letter Dd Use the ducks printed with the letters Aa, Bb, Cc, Dd, Ee, Sort the upper and lowercase letter Dd ducks onto the matching ponds. Letter Dd Sorting Mat Use the pictures and sort by beginning letter D sound onto the mat. Directions: Print Letter D Vocabulary Cards, Sort Uppercase and Lowercase Letter D, and Letter Dd Sorting Mat on cardstock and laminate for durability. 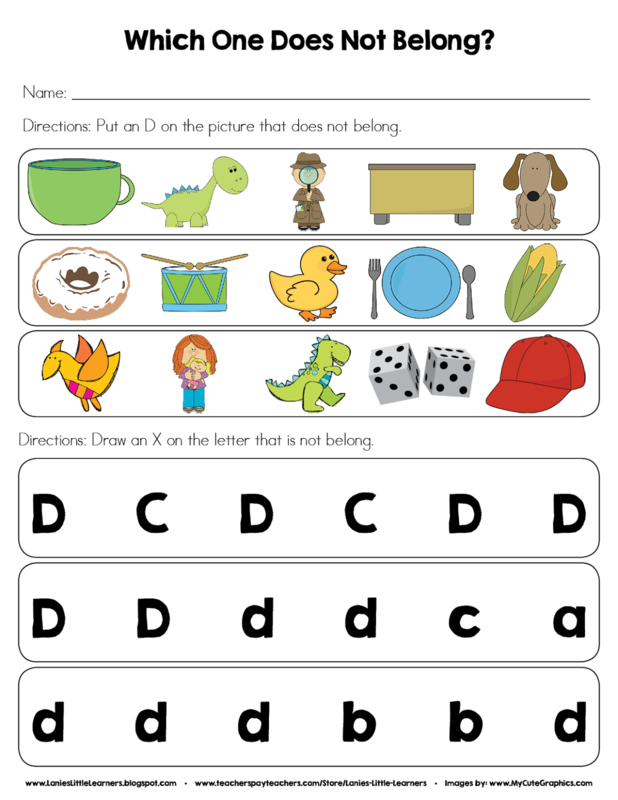 Practice beginning /d/ sounds and discriminating between the letter D and other letters.